Come on, cheer up, little by little we are approaching Spring and a milder weather. And it is during the Spring that classic cars racing events are back to the forefront, including the most famous of them: the Mille Miglia, which will make its traditional loop from Brescia to Brescia via Rome in May. 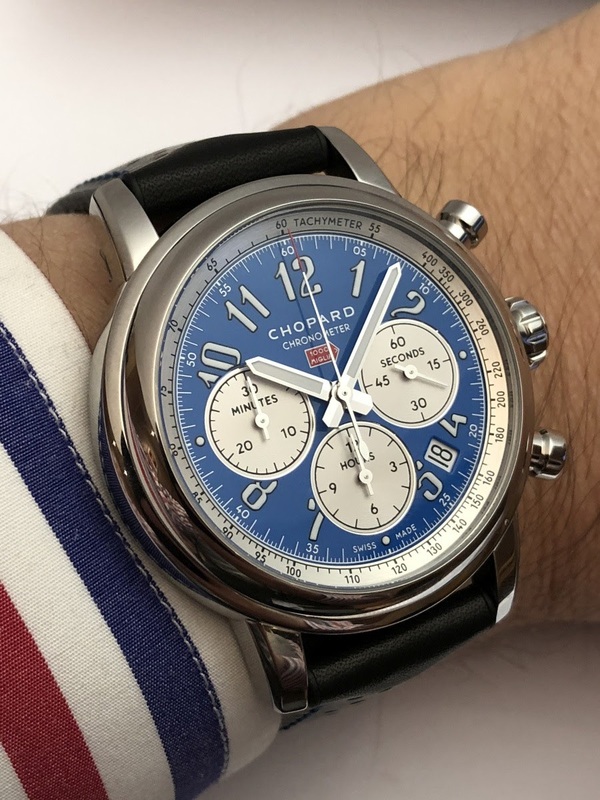 The opportunity is therefore right to wear during the competition one of the Chopard Mille Miglia Racing Colours watches that were presented last year to celebrate the 30th anniversary of the brand's involvement with the event. 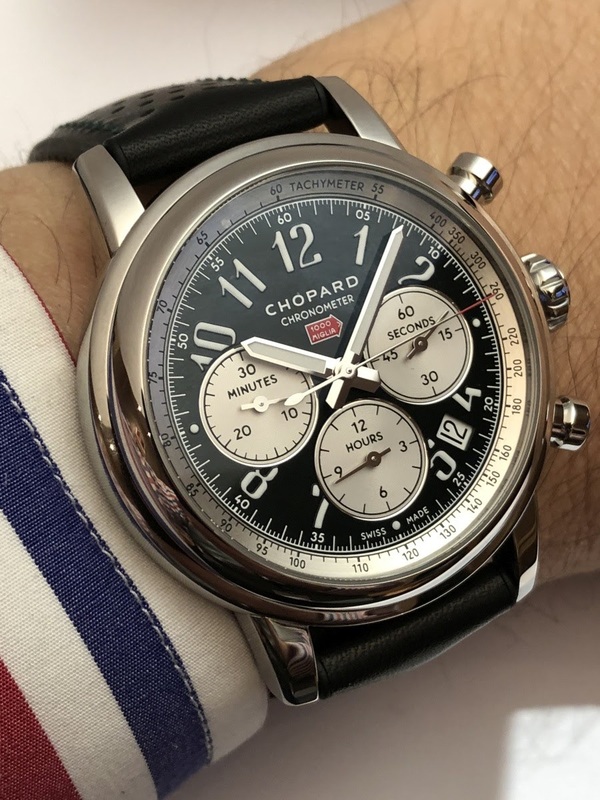 To be honest, these watches, of which there are 5 and released in limited series of 300 pieces each, present the classic characteristics of the Chopard Mille Miglia chronographs powered by ETA calibres. However, they differ from other pieces by the judicious choice of their dial colours. Because that's what we're talking about: the Mille Miglia Racing Colours are above all a nod and a tribute to the famous colours of the national car teams. And whatever colour you choose, it works perfectly with the characteristic atmosphere of the collection. These five colors are: Speed Silver (Germany), Rosso Corsa (Italy), British Racing Green (Great Britain), Vintage Blue (France) and Speed Yellow (Belgium). Each one manages to create its own atmosphere and gives a different personality to the watch. The secret of this success lies in the design of the classic and deliciously retro dial. 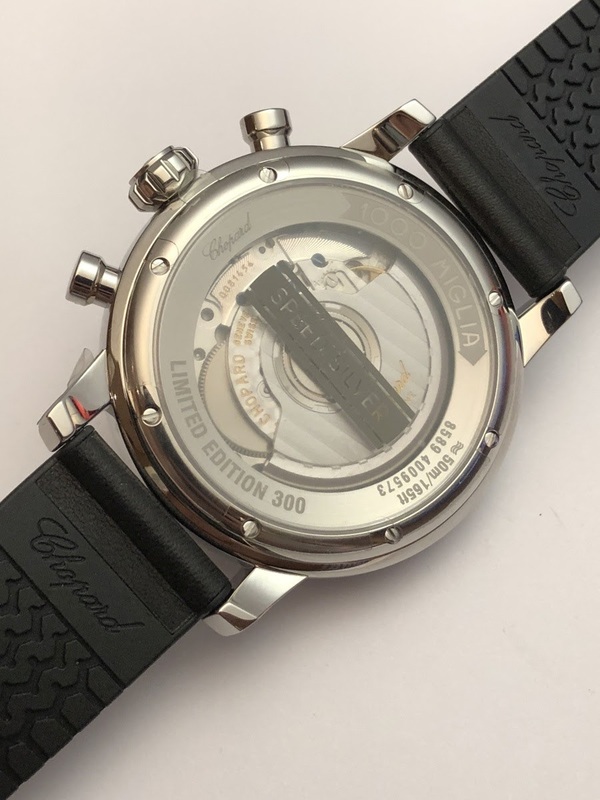 Nothing really surprising, actually, since I find again the usual elements of the collection: the peripheral tachymeter, the large Arabic numerals, the date at 4:30 am, the silvered subdials and the logo of the race in the upper part of the dial. The least we can say is that the dials are well occupied and that there is not much space left. It is the assumed Mille Miglia style and it is what also makes it charming. Thus, the colour used is not that dominant: it dresses the watch but it doesn't completely cover the dial. In 4 cases (the Speed Silver is different from the others in this respect), the strong contrast between the dial and the subdials clearly highlight the latter, which remain, in the end, the major players of the overall design. 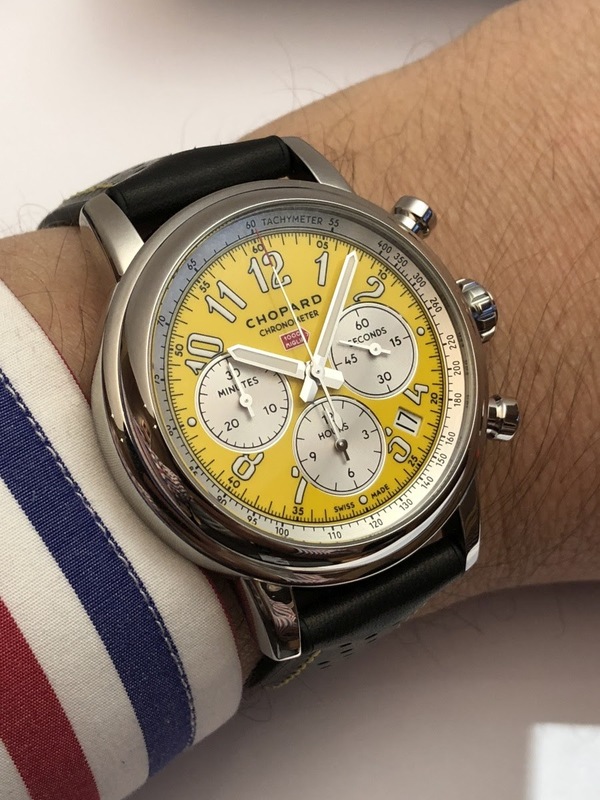 Even in the context of a bold colour like yellow, the whole thing remains in a good taste and at no time did I have the feeling of being confronted with multicoloured watches. In addition, the logo of the race also brings its own little touch of fantasy while being very reasonable. The five dials are carefully crafted, I really like the colour rendering (especially green and yellow) and the luminescent Arabic numerals are drawn with precision. Of course, as is traditional in the collection, they are cut for most of them. I don't mind: I prefer that the subdials feature a sufficient size. Finally, the peripheral flange gives a depth effect to the dial. The diameter of the steel case is 42mm. I think the size is the right one for this watch because of the very busy dial. The "mushroom" pushers, faithful to the car racing atmosphere, accentuate a little the perceived size. The watches have a see-through caseback, what makes it possible to observe the automatic movement that powers the watch. The type of colour used on the dial side is printed on this back. I must admit that I am not a fan of this approach: I would have preferred a solid caseback. First of all because the printing eventually hides the view of the movement and because the latter, an ETA2894-A2 is a modular calibre. However, there is nothing very embarrassing about it: it does its job on a reliable way and it is also chronometer certified. 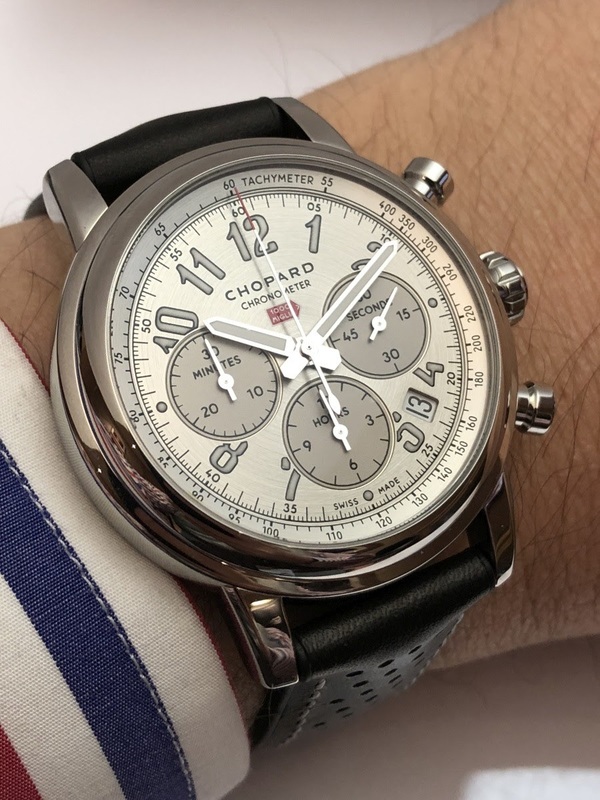 Its performances are classic (a frequency of 4 hz for a power reserve of 42 hours) and sufficient but behind the more recent movements features, particularly the one developed by Chopard and used in more expensive watches. 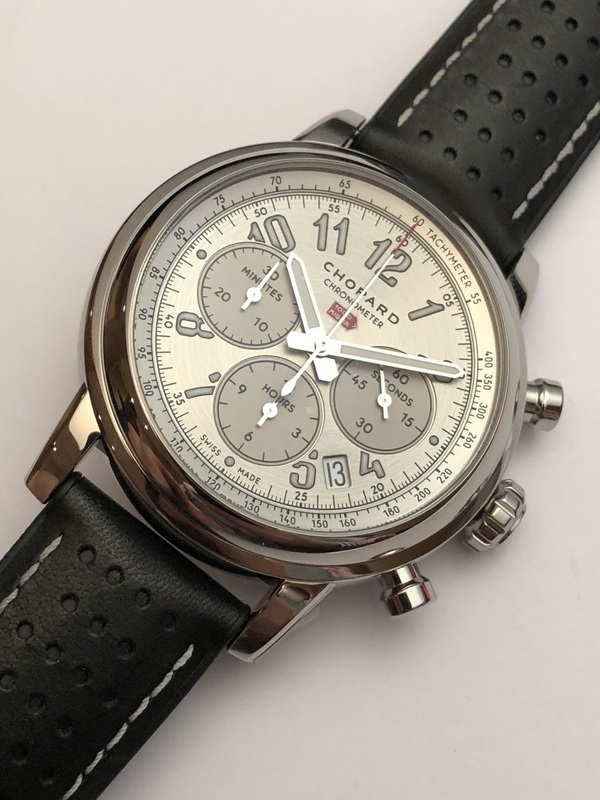 Once put on the wrist, each Mille Miglia Racing Colours watch is worn with pleasure due to the use of a leather strap with a rubber finish and whose topstitching takes up the colour of the dial. The strap uses a buckle and it is an option I prefer to make the watch more elegant. Among the 5 watches of this line, my favourites are therefore the green and the yellow ones. The first for its refined look, the second for its originality and boldness. The other colours may be less surprising but welcome and I find that the Speed Silver, even if its presence is explained, is too quiet in this context. Anyway, with 5 colours, there is something for everyone. 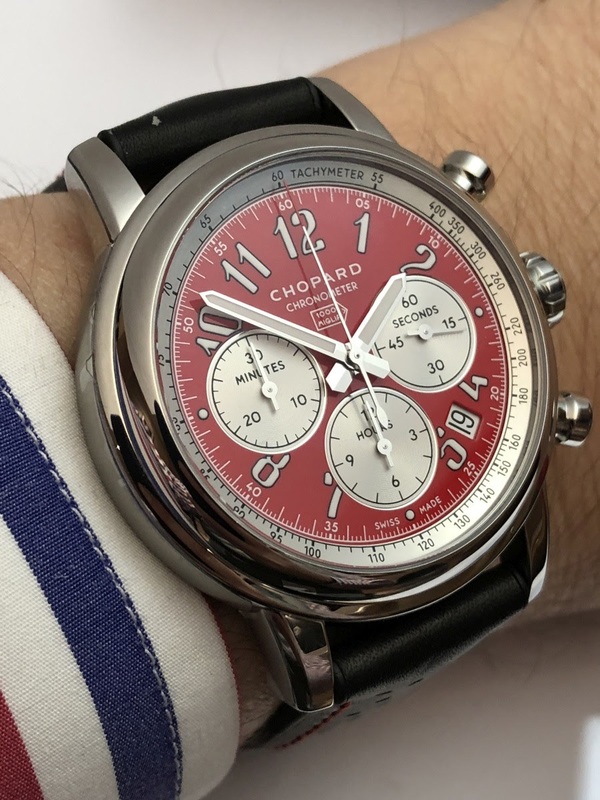 So, without revolutionizing the genre, Chopard managed to restore a pretty dynamic to its Mille Miglia collection thanks to these reasonably colourful models. All that remains is to choose your favourite team before heading back on the road very soon! Blue, red and black for me.